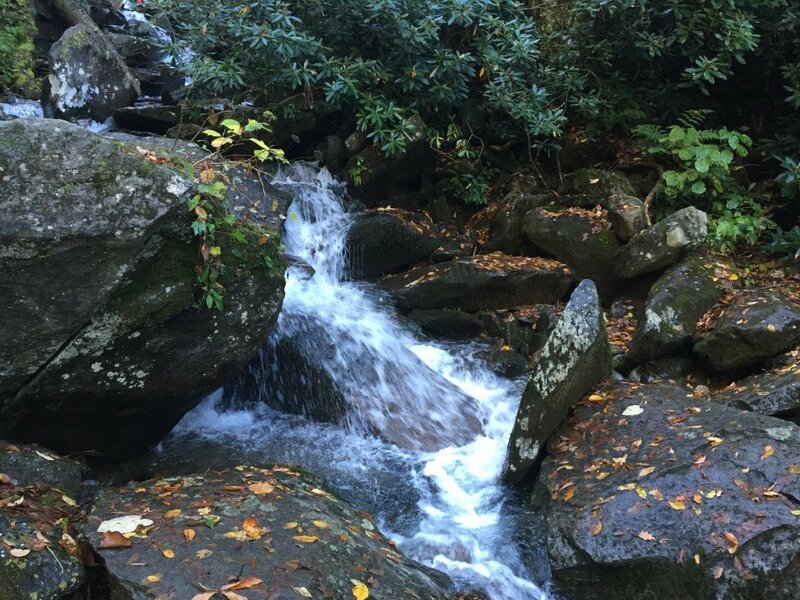 Although the Rainbow Falls Trail is difficult and will take 3-5 hours to hike, this is one of the most enjoyable and scenic hiking trails in the Smoky Mountains. Do not bring young children, but it highly recommended for those who are capable of hiking a moderately difficult 5+ mile trail. 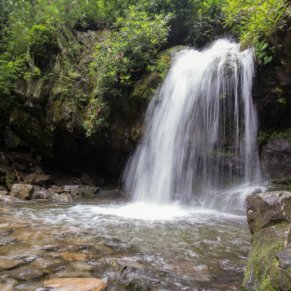 Lace up your sturdy hiking boots and head out to discover the famed Rainbow Falls waterfall in the Great Smoky Mountains National Park. The 80-foot waterfall is the tallest single-drop waterfall in the national park, cascading dramatically over a jutting cliff face and then rushing over rock formations at the cliff’s base. On sunny afternoons, visitors to the falls are treated to a stunning rainbow created by the water’s mist. 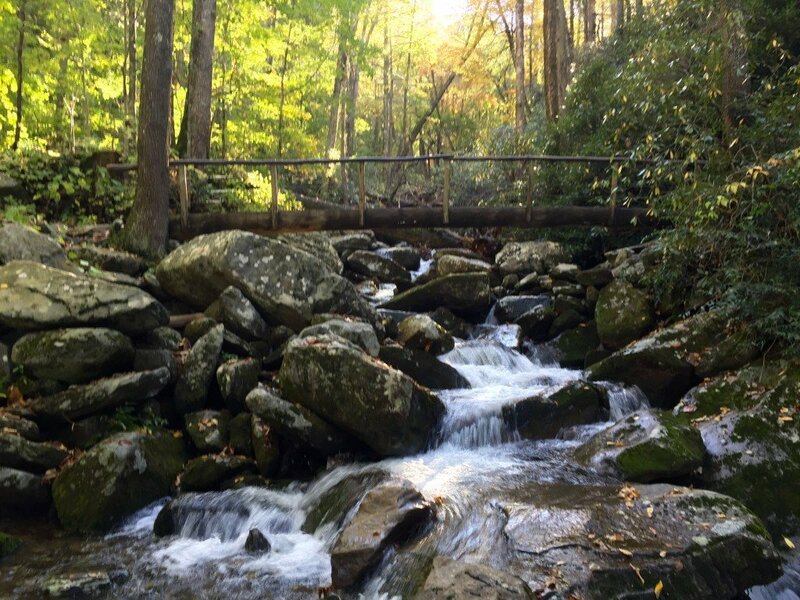 Access the Rainbow Falls trailhead off the Roaring Fork Motor Nature Trail. 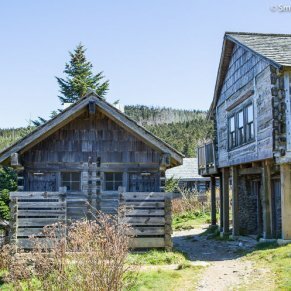 The trail, rated moderate to difficult, has a roundtrip length of 5.4 miles and an elevation gain of 1,500 feet. Due to the rapid elevation gain, this trail is not recommended for young children. If you see a “shortcut” along the trail, beware it is be more difficult than it looks— stay on the trail! The trail to Rainbow Falls is one of the oldest in the park and very well-traveled. The terrain often is uneven and can be rocky in places. Sandals, flip-flops and shoes without good treads are not recommended. 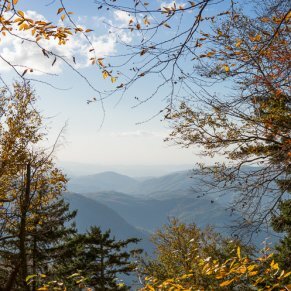 Wear sturdy hiking boots with ankle supports and your knees and ankles will thank you. Plan about three to five hours to hike to the waterfall and back to the parking area. 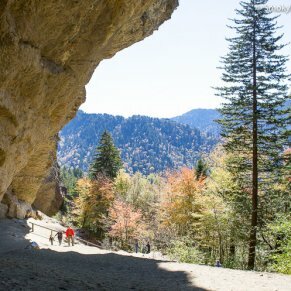 However, if you’re looking for a longer, more challenging hike, take the trail past the falls for about four miles to reach the summit of Mount Le Conte, which is only recommend for expert-level hikers. 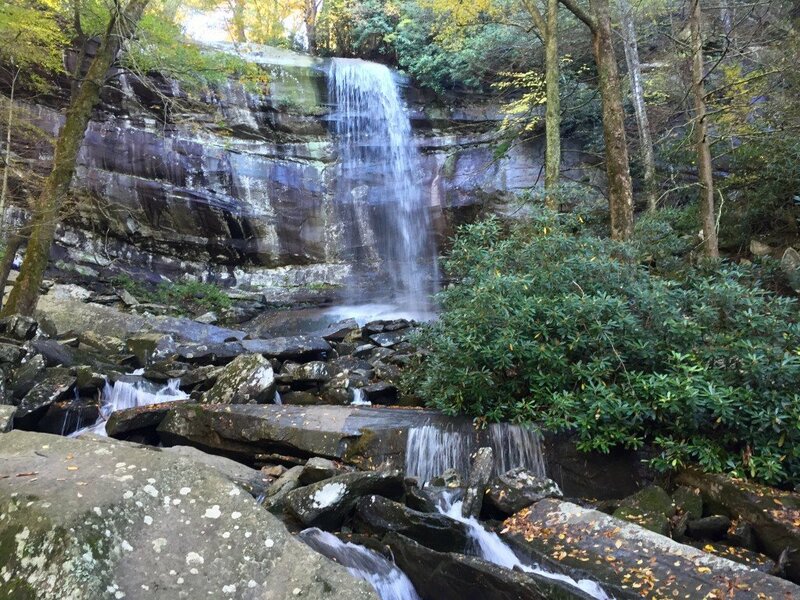 Be sure to pack plenty of water, snacks and consider bringing a picnic lunch to enjoy at the waterfall— Rainbow Falls is one of the most picturesque spots for a meal in the National Park. Although the waterfall is amazing, the actual trail itself has plenty of amazing views and scenery that should not be missed. 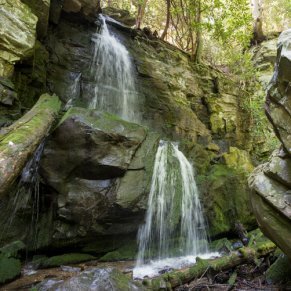 You will pass a number of mini-falls, boulder fields, scenic bridges, and creeks during your journey to Rainbow Falls. Foliage along the Rainbow Falls Trail includes spruce, mountain ash, asters, monkshood and the bright red blooms of the crimson bee balm, also known as scarlet bergamot. 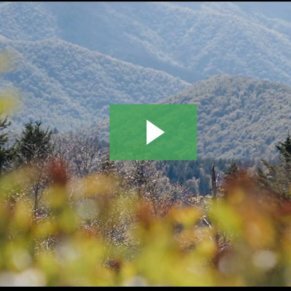 The high relative humidity during the growing season in the Smoky Mountains allows for its diverse vegetation and plant growth. Warning: Do not climb on the rocks surrounding Rainbow Falls. The mist and algae makes these rock extremely slippery. While the rocks may be tempting, be aware that several deaths have occurred in recent years and serious injuries occur on a regular basis. Insider Tips: If the first parking lot is full, there is additional parking one-tenth of a mile past the primary parking area. Directions: At the Space Needle (Traffic Light #8 in Gatlinburg), turn onto Historic Nature Trail Road. Follow this road for 0.7 miles to an odd intersection. At the intersection, take the fork to the far right (Cherokee Orchard Loop). Drive 2.2 miles further and enter the one-way Cherokee Orchard Loop. The parking area for the Rainbow Falls trail is 0.6 miles after the one-way loop begins.